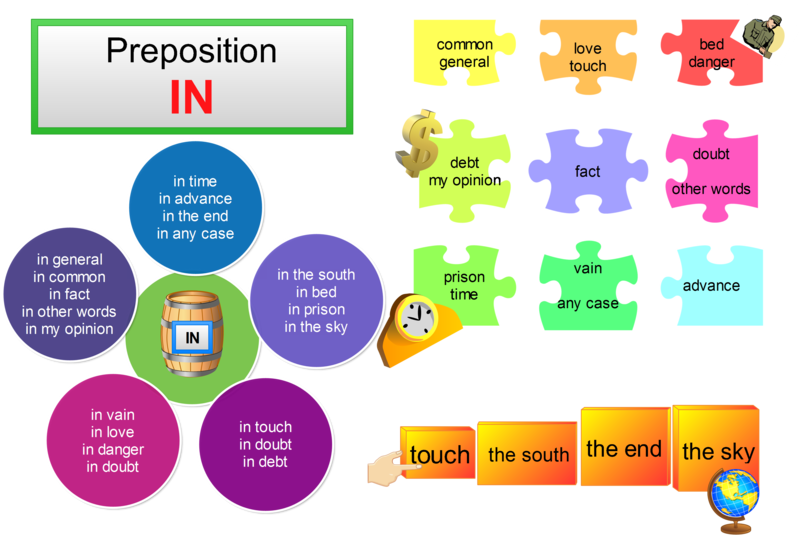 Prepositions are one of the favourite test items. They appear at tests like FCE or CAE and if you know them then you can get a lot of points. Moreover, if you use the prepositions correctly, people find it easier to understand you. The aim of this post is to teach several high-frequency phrases starting with the preposition IN. There are two quizzes with games a mind map and a mnemonic to help you remember all the phrases. The following mind map shows all the phrases that I would like to teach. On the right side there are the key words organised into simple logical lines which should make them easier to remember. Imagine a normal soldier who likes touching bed in danger. In the same way try to remember the other three sentences. The sentence after the slash creates the image you should remember. debt my opinion fact doubt other words / The debt in my opinion is a fact. Doubt other words. prison time vain any case advance / Time in prison is spend in vain, but it passes in any case. touch the south the end the sky / Touch the south end of the sky. I have prepared two HTML5 quizzes to practice the grammar. In the first quiz you should drag the correct word into the correct gap. This game will work on any mobile device too, so you can practice anywhere you go. The second game is a simple crossword. Complete the crossword with the phrases with the preposition IN. Again the game is in HTML5 and will work on any mobile device or desktop. Please what is the difference between ‘in campus, and on campus’? When I ask a friend if he is on campus at the time of my calling him, he replies that he is not in campus, why? I have never heard “in campus.” On campus is the common way to say it. Your friend probably misspoke, or you misheard.